Denicool Pipe Bowl Filter Crystals – for a cooler smoke! Have a pipe that doesn’t pull right or that gives you tongue bite? Then Denicool Pipe Bowl Filter Crystals are the answer. Specially designed to help absorb excess moisture in your tobacco while you smoke, these filter crystals produce a cools and dry smoke that pulls easily through the pipe. To use simply pour a couple of crystals into the bottom of the pipe bowl and fill with your favourite tobacco mixture. After you’ve finished empty the whole contents of the bowl and you’re ready to start again. Another bonus of these filter crystals is that they absorb a lot of the harmful tar which means that it’s healthier that regular smoking and also keeps your pipe cleaner. Denicool Pipe Bowl Filter Crystals come in a handy plastic carry box which contains 12 grams of crystals. Available now for £2.99 per pack these pipe filter crystals are a great addition to any avid pipe smoker’s arsenal. Denicool Pipe Bowl Filter Crystals are specially designed to help absorb excess condensation in the pipe while you smoke, providing a cool and dry smoke every time. 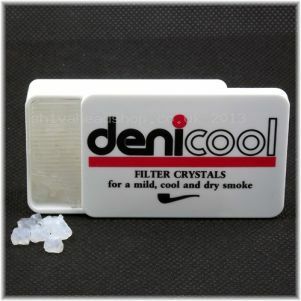 Simple and easy to use, Denicool Pipe Bowl Filter Crystals are a must for any regular pipe smoker. To use simply pour a few of the crystals into the bottom of the pipe bowl and fill it up with your favourite smoking mixture, easy! Having a layer of crystals in the bottom of the pipe bowl creates better airflow through the pipe and provides an easier draw compared to if you filled the bowl with just tobacco. Denicool Pipe Bowl Filter Crystals also filters out some of the tar providing a smoother, cleaner smoke. Each box contains 12 grams of filter crystals and are available now for just £2.99. Anyone who owns a bong will know that keeping it clean is a must for a great smoke. Dr Green Bong & Pipe cleaner is specially formulated to get rid of even the toughest dirt and is odour and perfume free leaving no aftertaste. Dr Green Bong & Pipe Cleaner can be used to clean various smoking paraphernalia and is perfect for ceramics, glass, plastic and metal. For best results it is recommended that you use this cleaner regularly and for heavily tarred items it is best to mix a small amount of cleaner with hot water. Dr Green Bong & Pipe cleaner is available now in 150ml (£3.99) and 500ml (£9.99) bottles. Why not check out Shiva Head Shops range of pipe cleaners and bong brushes, perfect for getting into every nook and cranny. The Popoca Pipe is a triumph of design and innovation, made from aircraft grade aluminium and polycarbonate plastic, this pipe is virtually indestructible. 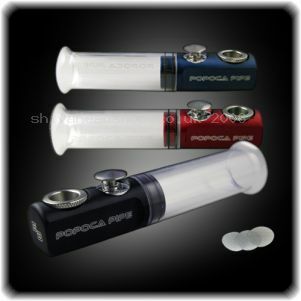 The Popoca Pipe is also really easy to use, simply load up your bowl, draw the smoke into the chamber and when you want a hit inhale and press the carburettor, simple! The Popoca Pipe disassembles for easy cleaning and there are a whole host of upgrades available including extended tubes for a bigger hit and glass bowls. The Popoca Pipes is available in black, red and blue for just £70; once you try it you’ll wonder how you ever lived without it. 6 Shooter Revolver Pipe – Mix it up! Do you like to mix it up when smoking your herbal blends? Then the 6 Shooter Revolver Pipe is for you. As the name suggests the 6 Shooter Revolver pipe has 6 compartments that you can put different smoking mixtures in, perfect for sharing with your friends or if you just want something different. This pipe is made from solid brass and high quality aluminium giving a strong and dependable pipe that will give you many years of smoking service. The brass compartments effortlessly spin around meaning that you can fill it up at the beginning of the night and smoke till the early hours. Because of the spinning compartments the 6 Shooter Revolver Pipe only needs one pipe screen making it even easier to use! The 6 Shooter Revolver Pipe comes complete with an Allen key for easy cleaning of the pipe and a handy draw string bag to keep it in when not in use. 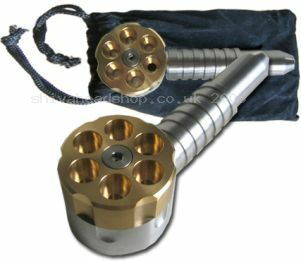 At just £22.99 each, the 6 Shooter Revolver Pipe is a great addition to your smoking arsenal. From the makers of Eject-A-Bowl comes this very nifty disguise pipe, the Better-Bat Cigarette Pipe. 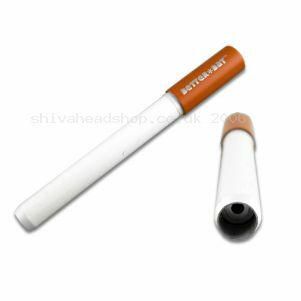 As the name suggests, this pipe looks like an ordinary cigarette so no-one will know your having a sneaky hit. Utilising the same technology as the Eject-A-Bowl, after you have used the Better-Bat Cigarette Pipe simply push the bottom up and all of the ash and debris is ejected ready for you to fill it up again with your favourite herbal blends, easy! The Better-Bat Pipe is available in two lengths (6cm and 8cm) and is made from anodised aluminium for strength and durability; they are available now from just £8.49 each.